As China consumes ever more coal, the degraded environment begs for an alternative form of energy. Contrary to Keith Bradsher’s article in the New York Times that argues China is financially struggling with solar panel capacity, I believe the demand for solar panels is high, but not being properly utilized. China, in need of green renewable energy, currently lacks the infrastructure to have efficient energy, but more problematically, sees renewable energy as a business instead of a solution to their high consumption and environmental issues. China needs green energy. If everyone in China were to have the same lifestyle as Americas’, in terms of eating, traveling, or shopping, we would need 4.5 earths to satisfy the demand of resources. China’s large population is already starting along with this path, and state planners predict half of the population will become the middle class in coming years. The government already knows it needs more energy, but why green? Recently, China overtook the U.S. as the world’s largest greenhouse gases emitter from coal, which causes health problems like acid rain, smog, lung disease, and water contamination. These detrimental health and environment effects should prompt China’s officials to invest in solar panels. Even though China’s large investment in renewable energy is not financially efficient, it is necessary. The production of coal-generated power is a third of the cost of solar power. 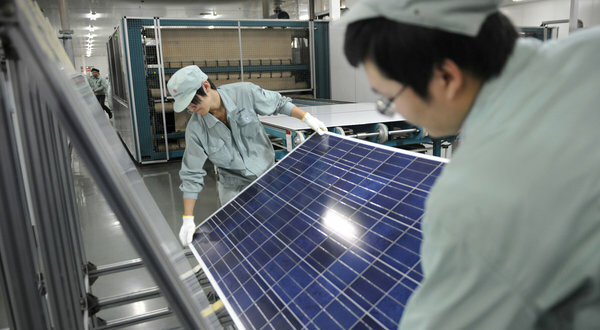 More specially, China’s biggest solar panel factories suffer a loss of $1 for every $3 of profit they make. Many of the renewable energy companies are going bankrupt from the lack of investors, in what Bradsher calls “a looming financial disaster”. The technology to make cheap, efficient energy has not been created, but waiting is not a solution. The environmental damage of destroyed land, eroded topsoil, and air and water pollution from mining and burning coal is too detrimental. Solar panels are a viable alternative solution. Keith Bradsher’s article states the large investment was from the “eagerness of Chinese businesses to rush into any new industry that looks attractive and swamp it with investments.” Problematically, China thinks of renewable energy primarily as a business instead of as a solution to an environmental issue. The government is not currently in control of the renewable energy industry, but instead, the banks control it by lending money to the companies. The government seems is more concerned about the bankruptcy of these companies instead of the positive externalities of the solar panels. There is a need for the solar panels, but money is thought as a bigger concern. If the government were to control the renewable energy industry, they could focus on improving the environment, more than just expanding business. With coal burning and mining causing health and environmental issues, solar panels are a necessary alternative. Even though they are cost inefficient, the technology is worth pursing. To slow down consumption in China is unrealistic, but understanding where the power lies is key. If the government were to invest the solar panels, they could be more widely used to address environment problems from relying on coal. Until the Chinese government takes over the renewable energy industry, the environment and people’s lives will be more damaged with time. Authorities should sacrifice money for the good of the people. Watts, J. (2010). When a billion Chinese people jump: How China will save mankind—or destroy it. New York, NY: Scribner.